Kaleidoscope Play & Learn was developed in recognition of the unique role that family, friends and neighbors (FFNs) play in providing informal child care for working parents in the United States. Kaleidoscope Play & Learn is a play group model designed to provide children with intentional, developmentally-appropriate learning experiences and provide FFN caregivers with information, resources, support, and connections to promote optimal child development. 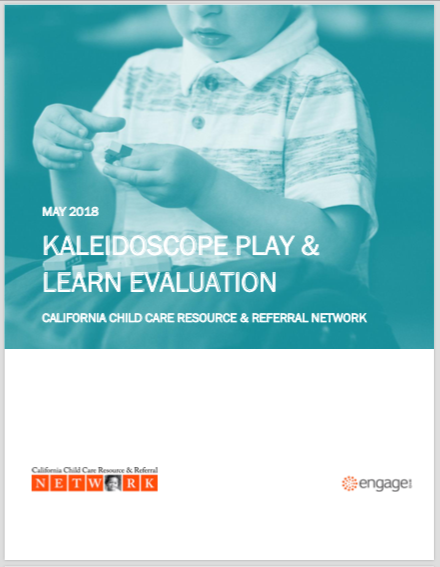 In 2015, the California Child Care Resource & Referral Network (referred to as the Network) initiated a pilot of Kaleidoscope Play & Learn at 9 resource and referral agencies located in 7 different counties in California. They partnered with Engage R+D to assess the impact of this model. The learnings highlighted in this report are based on interviews with Kaleidoscope Play & Learn facilitators, supervisors, and caregiver participants that were conducted between January and March 2018. This report also includes findings from the Agency Feedback Survey and a Caregiver Feedback Form administered by the Network.